Azer Kerimov was born in Baku. A. Kerimov, One-dimensional long-range ferromagnetic Ising model under weak and sparse external field, Inter.J.Modern Phys. 23, 32, pp.5899-5906 (2009). A. Kerimov, A block effect of external field in the one-dimensional ferromagnetical Ising model with long-range interaction, J. Phys. A: Math. Gen. 40 pp. 10407-10414 (2007). A.Kerimov, One-dimensional non-symmetric Widom-Rowlinson model with long-range interaction, Modern Physics Letters B, 21, 9, pp.559-566 (2007). 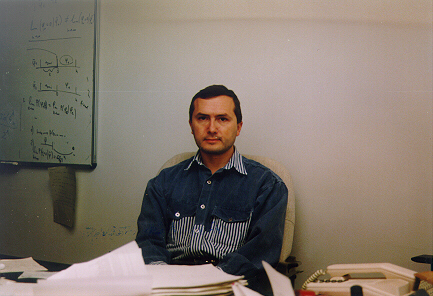 A.Kerimov, On the uniqueness of Gibbs states in the Pirogov-Sinai theory, Inter. J. Modern Phys. 20, pp.2137-2146 (2006). A. Kerimov, Phase diagrams of one-dimensional models under strong random external field, Inter. J. Modern Phys. 17, 30, pp.5781-5794 (2003). A. Kerimov, The relationship between phase transitions and percolation in models with ground-state degeneracy, J. Phys. A: Math. Gen. 35 pp. 5365-5378 (2002). A. Kerimov, Uniqueness of Gibbs states in one-dimensional antiferromagnetic model with long-range interaction, J. Math. Phys. 40 pp 4956-4974 (1999). A. Kerimov and S. Mallak, 'Density Gibbs states and uniqueness condition in one-dimensional models, J. Phys. A: Math. Gen. 32 pp. 3711-3716 (1999).